2 Why Should You Regrip Your Clubs? 3 How Often Should You Regrip Your Clubs? The golf grip is one of those things that many golfers tend to overlook not knowing that it can have a massive effect on their game. But, seasoned players understand the value of a good grip, and it is the reason why they will invest hundreds of dollars to get the best ones. Although a golf grip will not be a magical cure that will help you take your game a notch higher or reduce your strokes drastically, it will have a positive effect on everything from your swing to the contact you make with the ball. The golf grip allows you to maintain proper control of your golf clubs which in turn makes them more comfortable to swing. Also, it makes the club comfortable on your hand and is vital for getting proper swing mechanics. But, all golf grips are not the same as they differ in much more than the type, style, and comfort. And so it is necessary to know how to pick the right ones for your clubs. Understanding some fundamental things like why you need to regrip your clubs, how often to do it and also how to pick the right golf grips is always a good starting point. Why Should You Regrip Your Clubs? Most golfers know that they need to regrip their golf clubs now and then, but many do not understand the importance of this. First, the grip is the only part of the club that a golfer will touch when making a shot and it is the point from where you control the swing. And this fact alone is enough to show that you need to have the best grip and hence the need to regrip often. Secondly, all golf grips are of a material that ages and wears as you use the club. For the golf club to continue being comfortable and firm to wield you will need to change the grip regularly. By, regripping you will enjoy the traction of the new grip that will also make it possible to hold your club tightly. Being able to get a right hold of the club will eliminate the fear of losing grip during a swing, and so you will be more relaxed which results in proper swing mechanics. And as you already know correct swing mechanics and wrist action is the key to maintaining optimum power and control when swinging a golf club. How Often Should You Regrip Your Clubs? It is vital to regrip your golf clubs as the old one wears out but many golfers will still find it hard to determine how often they need to change the grip. And this will depend on the golf grip that you have and also other factors like the type of club and how often you use it. But, most professionals and experts in golf will advise that you regrip your club at least once a year or after about every 40 rounds if you play a lot. Even if you have the best golf grips and do not play often, you will still need to change them because oils, dirt and the elements will always be at work continually breaking down the materials on the grip. Although the frequency of play and personal preferences can make you want to replace the grip sooner, in most instances, there will be enough degradation after about one year to warrant a grip replacement. And one of the easiest ways to remember to regrip your clubs is doing it at the official start of the golf season (every spring). There are different criteria that you can use to categorize golf grips, but the most common one is according to the material. It is essential for a golfer to pick the right materials as it will affect both the quality and comfort and also its lifespan. The following are the most common types of golf grip. The corded golf grips are durable and suitable for all weather. They are the kind that involves wrapping a tough cord material around the handle. And besides, from being sturdy and durable, they are also the best golf grips for sweaty hands and for playing in the rain. But, they also have a few shortcomings such as being harder and rougher on a golfers hand than most of the other types and can wear out your gloves fast. Rubber golf grips are the most popular types for golfers that only play a few times every week. Many golfers love them because they are not as rough on the hands as the corded ones. Majority of the grips that you can get on the market are rubber or have some rubber in them. What makes them widespread is the fact that rubber is more straightforward to shape than most other materials and it will offer a firm but sticky feel. Its only drawback is that corded rubber which is one of the most common types tends to lose tackiness with cleaning. Synthetic blends are another modern type that is also one of the best golf grips for small hands and those that sweat a lot or like playing in the rain. These grips are also not as rough on the hands as the corded ones. They are a softer grip for the casual players than the corded ones, and they will always provide a more comfortable swing. The few drawbacks of the synthetic blend are the fact that they are susceptible to weather conditions and might be too soft for golfers that prefer to grip their clubs tightly when swinging. Leather is the traditional golf grip type or material, and it is one of the oldest kinds. And with this grip, you will get some strips of leather wrapped around the club’s shaft. The grip provides an appealing traditional look and is also tacky and soft to touch. But, it falls short in some aspects such as the fact that it is quite expensive, not as durable as most people might think and it will also offer poor playability in wet conditions. There are golf grips out there that will suit all golfers and their playing style. As a golfer, all you need to do is identify your needs and understand what each type has to offer to choose the best golf grips for your clubs. But, to make it easy to pick the right grips for all your clubs here are a few important things to consider when shopping. The grip type or material should always be the first factors to consider when looking for grips for your club set. And this is because it determines everything from the comfort and feel of the grip to the durability. The only way to make sure that you choose the best is by understanding the pros and cons of each type and the summaries of the most common golf grips in the market above should make things easy to understand. Also, sometimes it can be a good idea to use different materials on a few of your clubs just to test them out if you are still not sure what will work best for you. Grip size is the most critical factor to consider when shopping for your grips and this is according to many experts and professional golfers. And here you get to pick from four different sizes which are Standard, Undersize, Midsize and Oversize grips. But, you can also make further size customization by adding more layers of tape when installing it. Failing to use the right grip size can cost you up to 4 strokes every round, and so you cannot afford to go wrong. It is important to know that if your grip is too small, it will promote extra hand action and in many cases will lead to pulling the ball. A grip that is too large on the other hand will limit wrist pronation and can lead to shot slicing. The firmness of the grip is another vital factor that you should consider, and this is regardless of the materials that you prefer to use. But, the right firmness for you will depend not only on your preferences but also other factors such as your swing speed. For example, PGA professional and tour players with high swing speeds will prefer firmer grips as they promote stability while casual players with lower swing speeds will prefer softer grips. You can get golf grips in a variety of surface textures. The texture or design of the grip’s surface can create either a rough and somewhat abrasive feel or a smooth feel. What you pick between the two is up to your preferences, but the right idea is to go for something with a texture that will make the club feel secure and comfortable in your hands. But, if you are one of those ‘tough’ golfers that do not wear a glove something with fewer patterns and feels smooth will be the best option. Round or ribbed are some terms that you are likely to come across when shopping for golf grips. It is important to understand what the two mean as it will influence your choice. Round grips are those that are symmetrical in design, and they are ‘flat’ on the surface of the club. The ripped ones, on the other hand, will have a small ridge running the length of the grip. This ridge or rip will act as a guide or reminder for golfers on where to place their hands. While both types will still work well, the ripped ones are ideal if consistency is your key concern. Winn is one of the most famous names in the golf grip manufacturing industry. Anywhere you see the name you can always be confident of getting something top notch and comfortable. 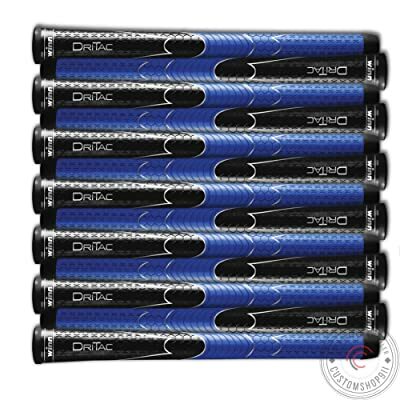 This set of some midsize grips is relatively affordable, and you can get it in 9 or 13 golf grip sets depending on the number of clubs that you have. The grips come in an attractive black and blue color combination and with some moderate graphics to make the grips more attractive. The texture is also just right for most golfers, and you can always be confident of getting a firm and comfortable grip on your clubs with these golf grips. And they are also the perfect size for both large and small hands. Installing the grips on your golf clubs should also be straightforward even if you are doing it for the first time and you should have them in all your clubs in just a few minutes. Large diameter will help with the grip and feel. They have a lovely color combination and patterns. These midsize grips will fit most hands perfectly. They make your worn out clubs feel new again. Each has a little mark on the end to make it easy to center on your clubs. You can get them in either a set of 9 or 13. There are a few complaints about durability, and this is more so on the driver. Will not work very well when playing in the rain. 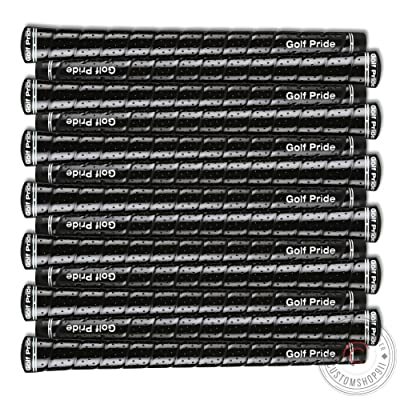 The classic all-black color scheme makes these golf grips ideal for use with any club as they will complement the clubs’ look and not make them look weird. 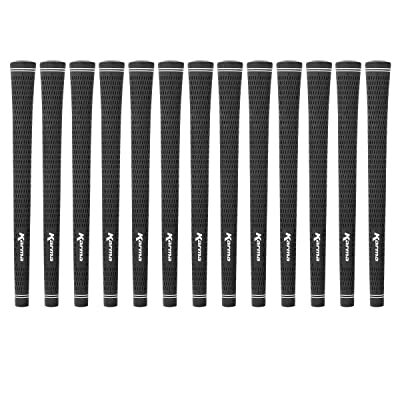 For a set of 13 golf grips it is hard to get something better at the same price, and so you can be sure of getting a lot of value for your money with this set. Although it does not come with the tape kit, you will only need to spend a few extra dollars to get it, and so this is nothing not worry you. Once you have the grips on your clubs, they will not only feel new but more comfortable to swing. And this is because these golf grips also include a soft rubber compound that will enhance their feel. These golf grips have a round shape that will work for different types of players, and they are midsize to make them suitable for different hand sizes. They come in a round shape that is quite comfortable and will work for most golfers. Softer rubber compound enhances the comfort and feel. Classic all black color schemes will suit the appearance and design of most clubs. The affordable price tag offers the best value for a 13-piece golf grip bundle. You will have to buy the tape and solvent separately. They have a somewhat dull look that is not very attractive. These grips have a tight fit and can be a little hectic to get on the clubs. Here is another excellent set of standard golf grips by Winn. 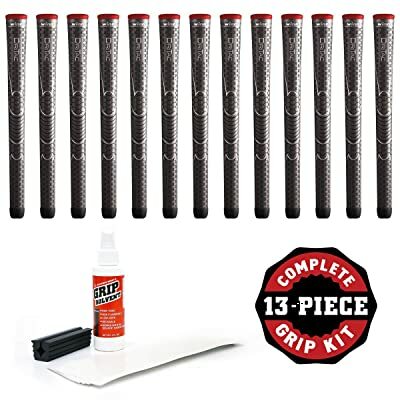 The 13-piece golf grip kit also comes with a 4 oz bottle of grip solvent and rubber vise clamp. And so you will get everything that you need to regrip your clubs without having to spend any additional money. These are some of the tackiest grips that you can get in the market, and they also feel just firm enough on your hand and have a fantastic texture. The WinnDry polymer material delivers all-weather playability, and you can be confident of maintaining an excellent grip on your clubs even when playing in the rain. And they have a contoured wrap spiral design that will provide a glove-like fit so that you always get added stability. With these Winn golf grips, you will also get improved clubhead feel and distance thanks to the unique WinnLite technology that cuts the grip weight by half. A complete set of golf grips with everything you need. These are some of the tackiest grips that you can get anywhere. They use a polymer material to deliver playability in any weather. The contoured spiral wrap design provides a perfect fit to make the grips more stable. Winn uses modern technology to make the grips lighter to improve clubhead feel and distance. They are standard size grips that will be ideal for all hand sizes. Incredibly tacky and soft golf grips. Some golfers complain that they wear out fast. They can be a little hard to install for first-timers. These golf grips are still a little slippery. For golfers that prefer to have some colorful grips on their clubs here is a perfect set. It is a complete set of 13 grips that includes a 4oz bottle of grip solvent, 13 strips of 2-inch double-sided grip tape and rubber vise clamp. And so you will not need to buy anything to install these golf grips. Besides from adding some color and style to your clubs they also feature a multi-textured surface that will provide an excellent feel and just the right firmness. Also, the texture makes the golf grips slip-resistant even in wet conditions. You can get these grips in lime green, blue, neon yellow and orange which means that is easy to get something that suits your clubs. Installing these rips on your gold clubs should also not be hard because they will come with some clear and easy to understand instructions even for first-timers. It is a complete grip kit with everything you need to regrip your clubs. They provide an excellent way to add some color and style to your golf clubs. The multi-textured surface provides an excellent feel and firmness. Slip-resistant grips that will remain in your hands firmly throughout the swing. There are some clear and easy to understand instructions that will be handy for first timers in regripping clubs. Relatively cheap given that it is a complete set. You can choose from five distinctive grip colors. Not a very impressive set for golfers that might not like brightly colored golf grips. They feel a little thinner than what you get from the top brands, and they might need more frequent replacement. These grips seem to take more glue than others from the leading brands to attach securely. The Golf Pride Tour Wrap 2G is a top-notch kit of some standard golf grips that will be a perfect replacement for your worn out gold grips. The traditional style makes these some of the best golf grips on the market as they not only look great but are also comfortable in your hands and provide an excellent feel. They are quick and straightforward to install, and all you will need to do is buy some grip tape and solvent. And the grips have an excellent texture that will impress most golfers regardless of their handicap and playing style. Each of the golf grips will also provide a tacky feel and make it easy to get just the right amount of grip pressure. Standard size grip will be suitable for most golfers. Complete set with 13 grips for all your clubs. Easy and quick to install even for beginners. They provide a tacky feel to make it easier to release the grip pressure. These grips have an excellent texture and also look good enough. The traditional look will enhance the appearance of your golf clubs. There is no grip tape or solvent in the package. They do not have alignment marks, and this can be a shortcoming for beginners that use the grip for alignment. Some golfers complain that they are thin and will not hold up well for long. Now that you know that you need to regrip your clubs, when and how often, the other important thing to understand is how to do it. For a cost of around $75 to $130 for the entire set, you can have your clubs regripped. But, it is also possible to do it on your own without having to pay someone. However, this will require you to learn how to do it as a DIY project, but there are plenty of instructional videos online to help you with this. Golf grips are one of the most crucial parts of your golf clubs, and they will affect your performance directly. And besides, from being the only part of the club that you will touch when playing, they are also one of the sections that tend to wear out fast. What this means is that you will need to regrip your clubs quite often. But with our guide above and reviews of some of the best golf grips in the market you should never have any difficulties choosing when you need replacements. Lastly, even when you get the best golf grips, you need to maintain them well by keeping them clean and dry at all times.